When we learned about weather in our science kit we talked about how the weather is always changing and how we have to do different things or dress differently because of the weather. I have really been thinking about this for the past few days. I wanted this post to be about all of the science that I am doing on this trip, but the weather has taken over! We were doing a lot of fishing off the coast of Georgia and our plan was to stay there for a few more days. We had to move because there was a storm that was headed right towards us. It has not rained that much. The problem is the wind. The wind makes it dangerous to work on the boat and can make large waves. If we stayed where we were there would have been waves about 5-10 feet high. Some would have been even higher. This would have been too rough to work in so we headed south to the water off Daytona Beach, Florida. After a while the water got rough there too so we headed even further south. 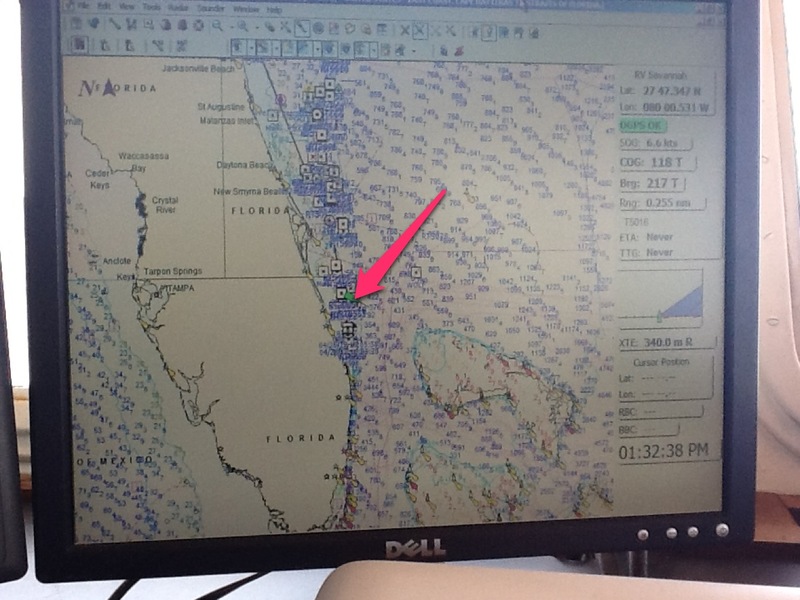 Right now we are about 30 miles off the coast of Vero Beach, Florida. The wind is about 20-25 miles per hour. (That would definitely be a “2” on our wind scale if we used our flags today!) That is the speed limit that cars can drive on our school’s street! The waves are about 6 feet tall right now, which is taller than I am. The boat is rocking back and forth a lot. This makes it hard to walk, but it’s also pretty funny because I need to hold onto the walls wherever I go! The boat was rocking a lot today. Sometimes I had to hold on while we waited to drop the traps. We are done fishing for the day because the wind is getting stronger, but we will start again in the morning. We are going to go closer to the shore where the waves will not be as big. When we get there the captain will set the anchor. The anchor will grab onto the ocean floor and hold us in one spot for the night. 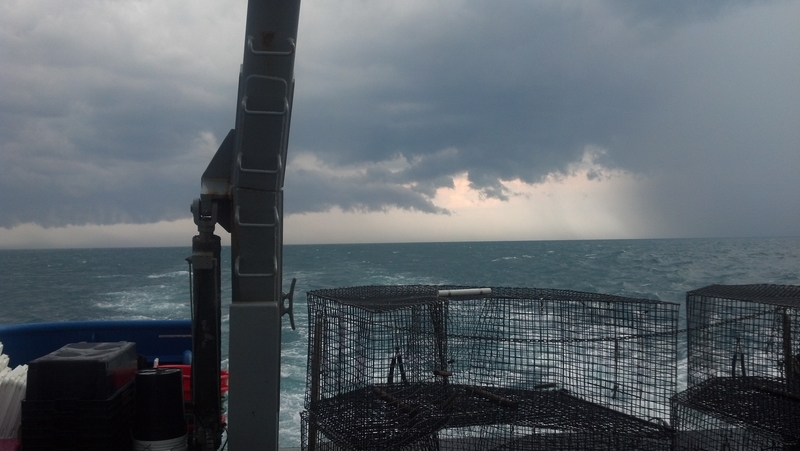 We will head back out to sea in the morning when the storm passes. Weather also affected the way I packed. About three weeks ago I was on the beach with my mom and I was so cold! I was nervous that I was going to be freezing on the boat because I knew I would be working outside until midnight. So before I left for my trip I bought a whole bunch of really warm clothes to take with me. I haven’t needed any of it! It is a little more chilly on the water than it is on land, but I still haven’t needed more than a sweatshirt and shorts to stay warm. I checked the weather in New Jersey, and I checked the weather in Georgia, but I didn’t believe it! I should have trusted those meteorologists! I can’t wait to tell you everything I have learned from the scientists on the ship! 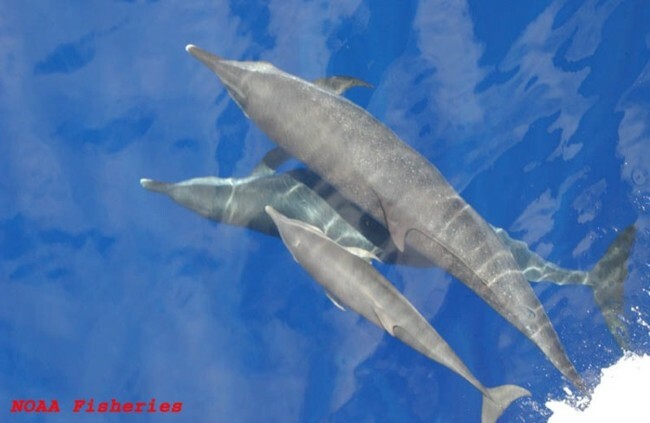 I also have some GREAT pictures of dolphins for you. They were jumping out of the water and put on quite a show for us yesterday. Make sure you check back soon to see them! I’m seeing for real that being a research scientist can be really exciting and hands-on when working out in the field. In our routine of launching UCTDs every hour while steaming towards our target, more acquisition of ocean data takes place in other ways. 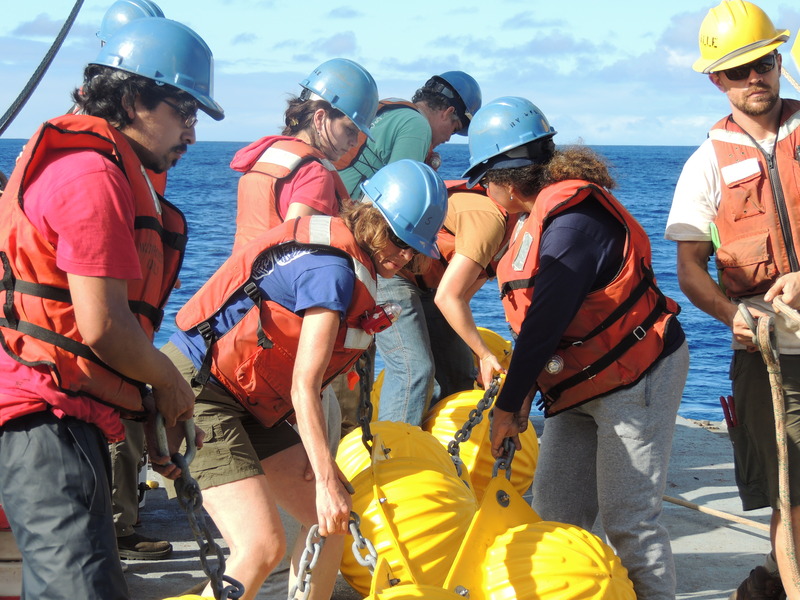 At certain coordinates, WHOI deploys drifter buoys that monitor ocean characteristics as they drift with the current. The data can be followed on line not only by the scientists, but by the public! Two were launched this morning on our watch at coordinates 21º S, 84º W. And one of them is Kittredge’s adopted buoy! It is serial number 101878. As you can see in the video clip and photo below, I’ve made sure a little bit of Kittredge Magnet school is left here in the Peru Basin of the Pacific Ocean, where it is about 4,400 m in depth. It’s time to launch the drifters! All the fish that see this will know about our school! 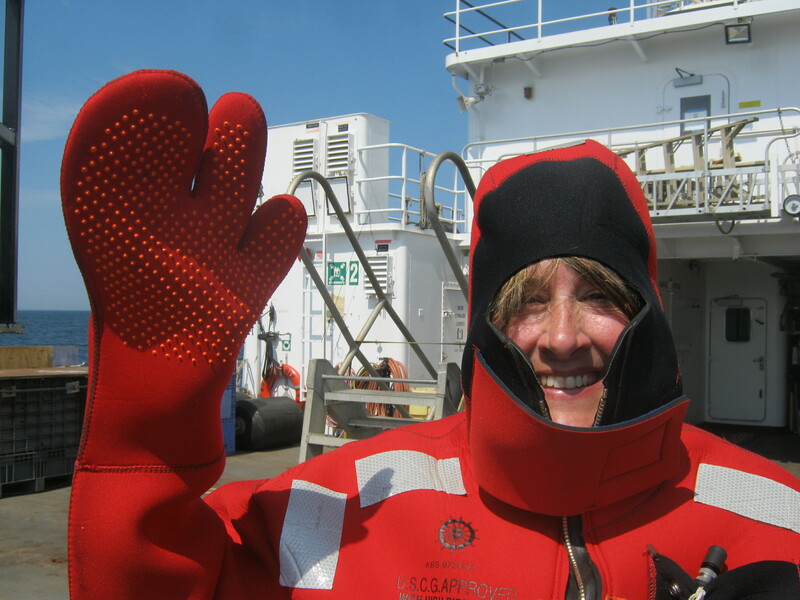 KMS went swimming in another way, too – my KMS hat flew off my head while working on the aft deck. (Sorry, Mrs. Lange!) Science Rocks in the South Pacific! The team did a second CTD deployment – this one to the bottom, about 4,500 m. This is precise work, to analyze maps and bathymetric data to be accurate to find the depth at which it is desired to anchor the Stratus 12 buoy. Keith, Jamie and I were “spotters” with the rosette as the crane lowered it down. 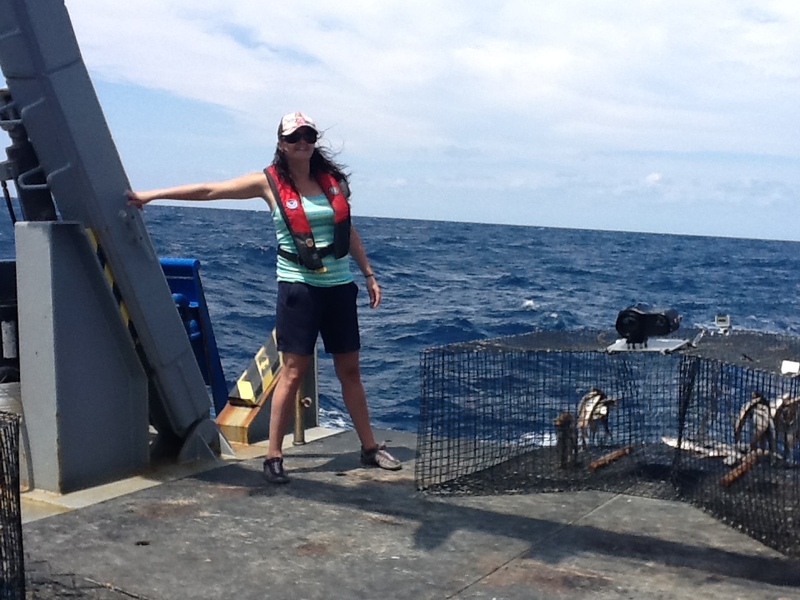 Pamela, who is studying phytoplankton, retrieved samples of water with organisms from this deployment. However, due to customs in Ecuador, it is tricky for her to get her samples back to Chile. Ecuador does not allow anything into the islands that may potentially contain anything living thing, even a sealed sample of water containing plankton. So the samples will continue with the ship to San Diego and then be shipped to her in Chile. We made it to the old buoy! It was exciting to see Stratus 11 come into view. The bottom area was surveyed in great detail within a few miles of the Stratus 11 to confirm Seb’s chosen spot for Stratus 12. Dr. Bob Weller and Jeff Lord have a pre-deployment meeting with the captain and some key crew members who will be assisting. The next day, the deployment of the new mooring, Stratus 12, is a full day of coordinated teamwork – about 4,500 m of cable with 2,000 m of instruments. The first 50 meters at the surface has 20 instruments! It took over 8 hours to put the buoy and all attached instruments in the water, and that is after hours of assembly on the aft deck. One new instrument added was at the deepest part of the ocean in this area and will provide data on deep ocean temperatures and salinity, something currently missing from climate models. We enjoyed perfect ocean and weather conditions on the day of the launch! The Stratus 12 buoy is in the background behind me. After the last instrument is placed on the mooring line, its anchor is sent down. 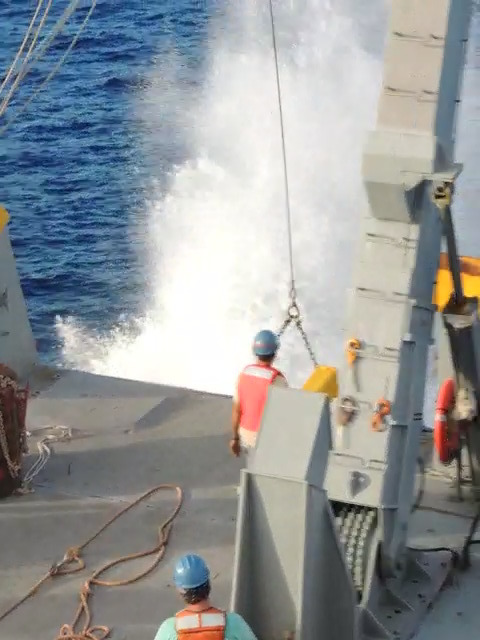 At 10,000 lbs., the anchor drop makes a really big splash! All hands are on deck to contribute to the mooring assembly and launch. 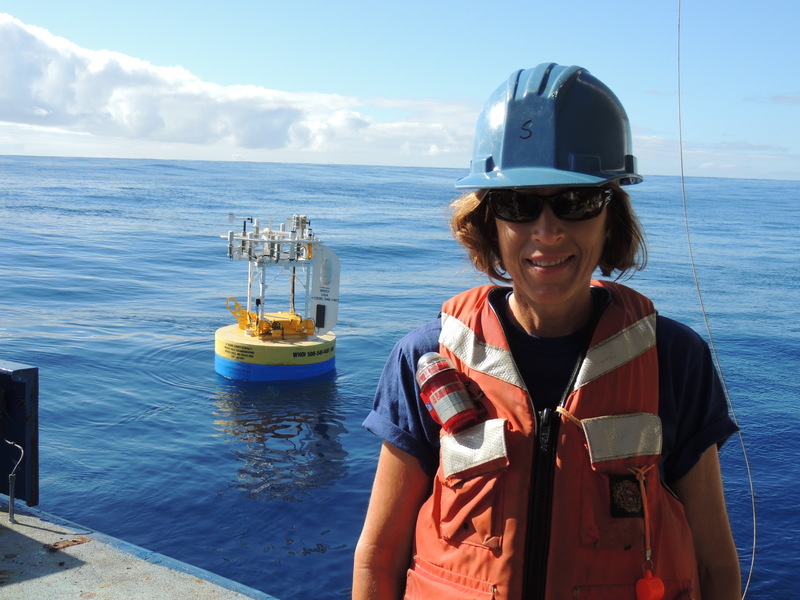 The all night watches are not over, though – we must continue to collect bathymetric data to map the ocean floor around here. Only about 5% of the ocean floor is actually mapped, and when the team returns next year, they may not be on the same ship. Not all ships have the same sophisticated multi beam sonar as the Melville. Those on watch are actually watching the sonar monitor display as the ship engages in the “mowing the lawn” technique to create a detailed map. The Melville will “hang around” in this area for a couple of days before we remove Stratus 11 from the water. This allows time for data to be transitioned from one buoy to the new one. I am told recovering the buoy is going to be some dirty, grimy work! The area off the coast of Pacific off Northern Chile and Peru has been historically difficult for climatologists /meteorologists to model. To predict climate, varying parameters of atmospheric conditions are fed into a computer to simulate what the outcome will be. The predictions made are then compared to actual conditions to determine the reliability of the computer model. Meteorologists have not been able to accurately predict this region: the actual ocean conditions are much cooler than the computer predicts. Another finding showing the importance of this area is that when the type, thickness, and altitude of clouds in the Northern Chile /Peru basin are changed for simulations, almost the whole Pacific Ocean’s heat distribution is in turn affected! Satellites gather data remotely, but the constant stratus clouds block satellite data transmission, so it is just not reliable. Data must be collected right here. Given that oceans cover 71% of the planet, and the Pacific is the largest, fully understanding this region is critical to building accurate climate models. Therefore, the Stratus research brings us to 20º S 85º W.
Animal life has been spotted! On two days, we saw whales! One – perhaps a Blue Whale – was far away and just its fluke was seen. The next day we had two whales swimming close to the ship, and we were able to watch them and hear them breathe for a while. According to the crew, seeing whales in this area is rare. It’s odd to be in a body of water teeming with life and see so little of it. We also encountered only one boat, a Spanish fishing vessel. Bob and Mark continue to feed us well. The food storage area is below the main deck and they use a dumbwaiter to bring the food up to the kitchen where it is prepared and served. There is food from all over the world; the ship was in South Africa before reaching South America. All of the meat is from South Africa and also some of the coffee. One night, we had some kudu meat – like steak, but from antelope. It was very good, and tasted like bison. Every country’s Customs sends agents to inspect the food service area while in port. The U.S. Customs is very strict and will not allow foreign food into port, so maybe that is why they are feeding us so much! The cooks work at least 10 hour days. Bob has been a cook for 21 years and his favorite part of his job is getting to travel. Mark, our other cook, has been in this job for 10 years. 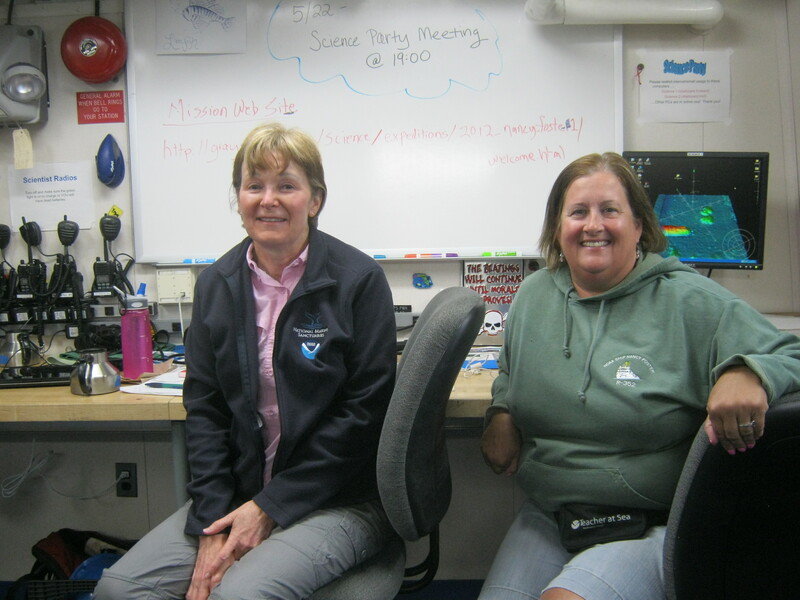 Both of them work for Scripps, as it operates the boat. Here’s how much we have been eating daily – 7 dozen eggs, 5 heads of lettuce, 5 gallons of milk, and there are NEVER any leftovers! The kitchen always keeps some of the meals for the “midnight rations” so those who sleep in the daytime and work on the night shift from midnight to 8a.m. do not miss out on any of the good fixins. Finally, I am used to the noise and can sleep pretty well. It’s like I am in a room with power tools being used, even with ear plugs, you can hear the engines. Everyone here is in the same boat, though (pun intended!). 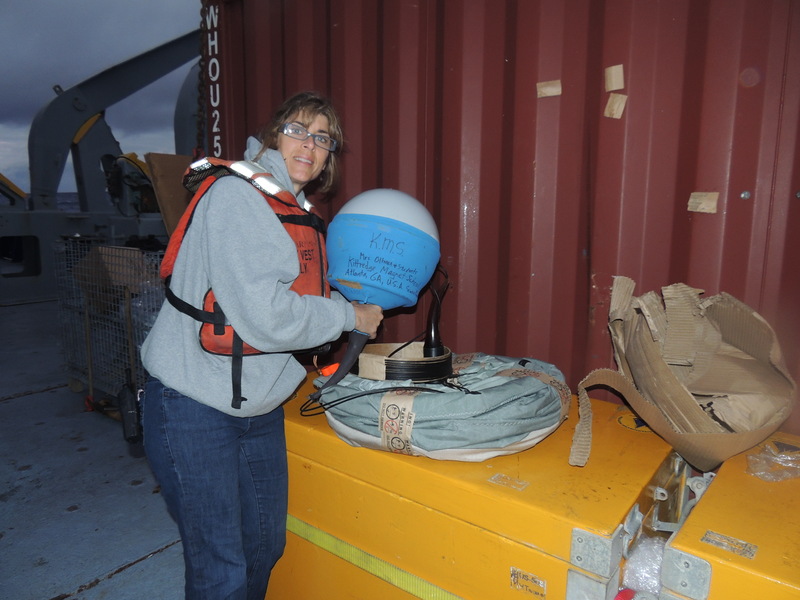 Our next exciting task is ahead, recovering and cleaning up the Stratus 11 buoy. 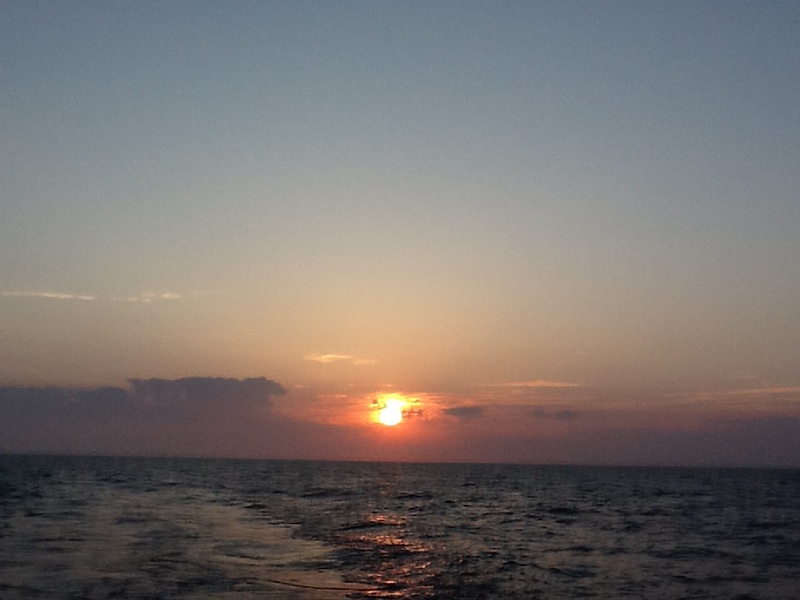 The weather has been terrific – clear, in the 60’s with a little wind, nice sailing with the current helping us along. We are in the trade winds region. The view from the bridge (Captain’s pilot house) is excellent. Everyone is terrific and very patient in showing us the ropes. There’s plenty of time to get to know people. I’m getting to practice my Spanish a bit with our 2 students from the University of Concepcion (Chile) and two more Spanish speakers, from Chile and Ecuador. The two others on watch with me are Seb Bigorre (WHOI) and Ursula Cifuentes, a grad student from Chile, so we speak some Spanish during the watches. 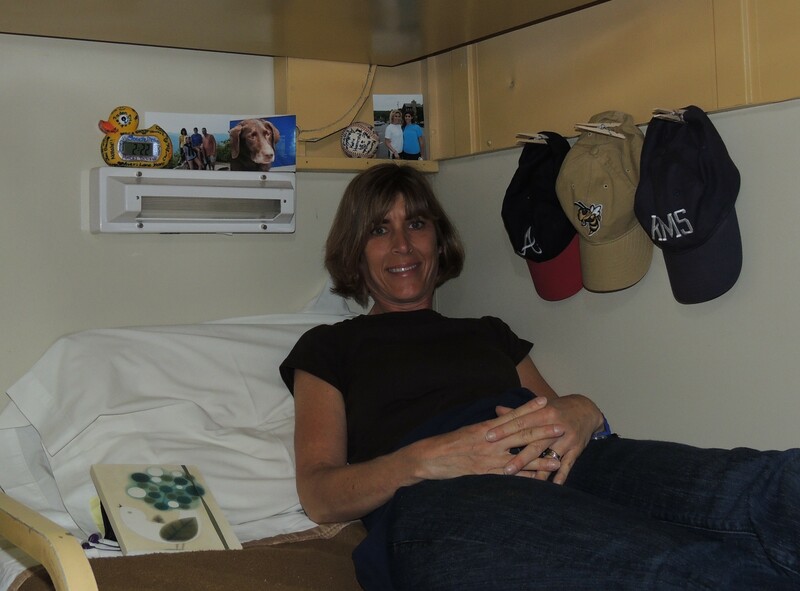 Life on a ship is different, but some of the comforts of home are here, too. Thank goodness there is a laundry, otherwise I would have had to bring 3 weeks worth of clothes! The food has really been fantastic! 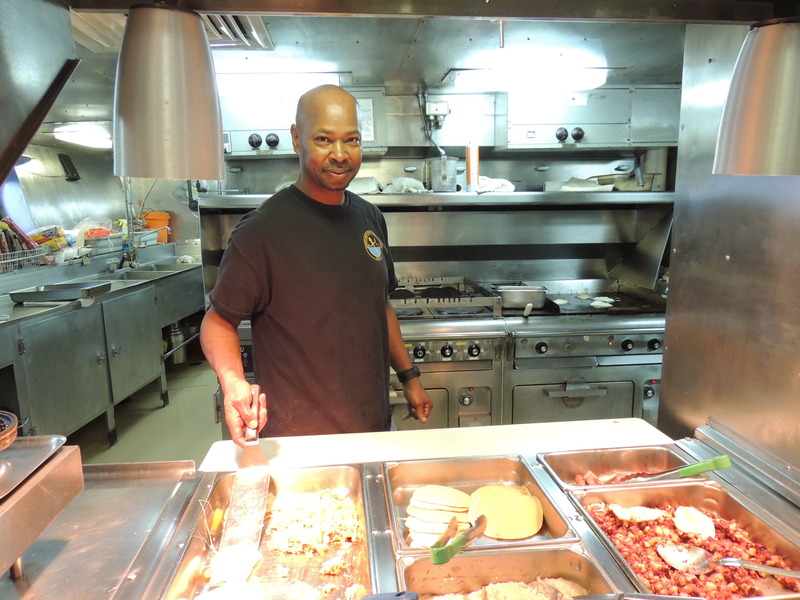 Mark is one of our friendly cooks who keeps everyone on the ship happy! 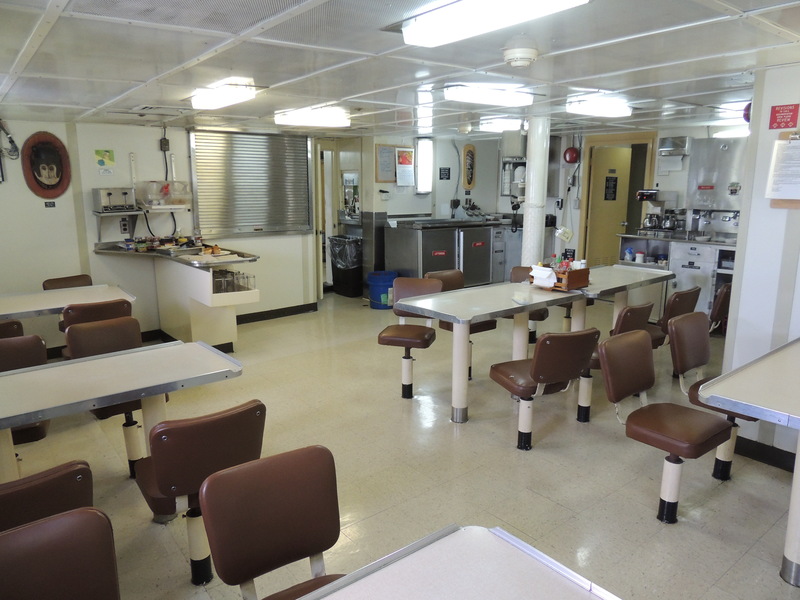 The mess deck is where we eat our meals, grab a snack, or sit to read or chat at off times. The dinner tonight is carne asada (fajitas) and you can smell it cooking. Bob and Mark, our cooks, have also served us white bean chili, salads, cheeseburger sliders, roasted chicken, fish, pork roast and vegetables, seasoned hash browns, bacon and eggs, all kinds of fresh fruit, not to mention the desserts like blueberry cobbler and cinnamon rolls. With all this great food, I was thankful to find that the crew makes places on the ship to work out! Some do “laps” by walking the ship a few dozen times around. There is an exercise room with weights and bikes and more equipment can be found in other places around the ship. 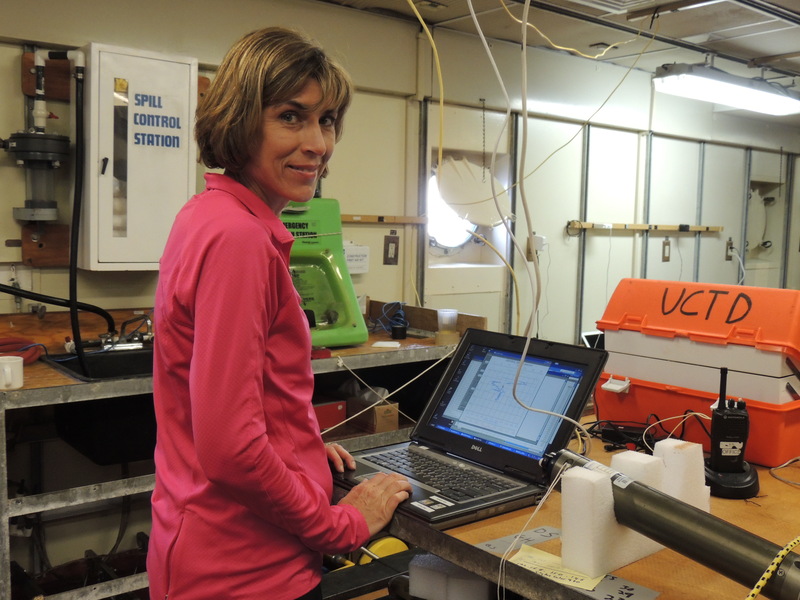 The Woods Hole UOP (Upper Ocean Processes group) and rest of the team is now in a rhythm of deploying probes and gathering data. Like super sleuths, we are tracking a cold, relatively fresh water mass which originates inValparaiso and moves northwest. This water mass lies under the warm, salty surface layer. At 50 meters depth, there is a clear distinction in the water masses since we began deploying the UCTDs. Just like a detective matches fingerprints, we have a “fingerprint” of the cold, fresh water. A seasonal thermocline has been identified! Nan Galbraith, a programmer from WHOI, is processing all of the numerical data into useful images. The surface water layer (graph) has a temperature about 20º C and salinity > 35 ppt (parts per thousand). At 50 meters depth, the temperature abruptly drops to 17º C and falls to 7.5º C at 400 m which is the bottom depth we are testing; similarly the salinity drops to 34.1 ppt. Although we are traveling through water about 4,000 m deep, we are interested in tracking this water mass. I’m still having trouble remembering approximate Celsius to Fahrenheit conversions: here’s a link to help. However, another factor has come into play which we must consider. We are nearing a tectonically active area – the Nazca Ridge, a fracture zone. 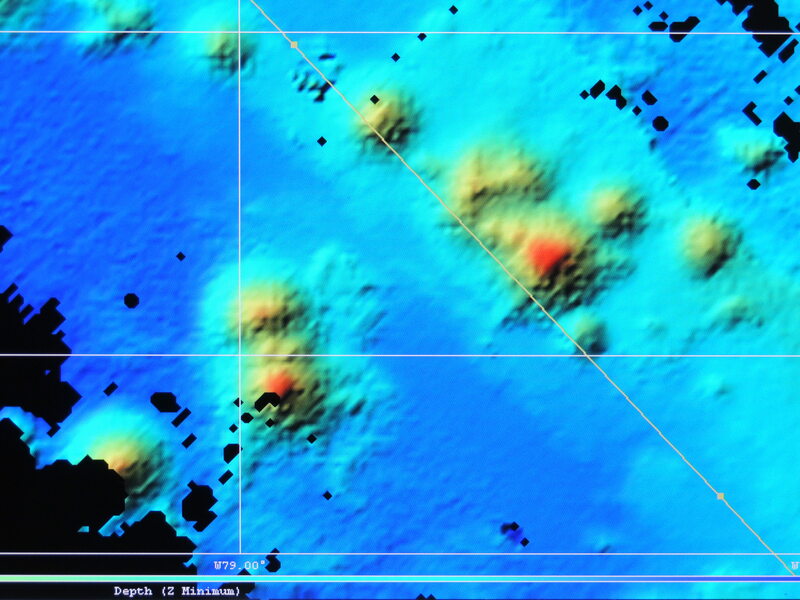 There are many seamounts, some of which have not been previously mapped. Whoever is on watch must look at the ever-changing multi-beam sonar display to look for seamounts – we don’t want the instrument to slam into an underwater volcanic mountain! The closer we get to the Nazca Ridge, the higher the likelihood of seamounts. We constantly monitor the multi beam sonar display for bathymetry and sea floor features. The red or yellow circular areas are seamounts. All in all, we will cover about 2,268 miles until we reach the Galapagos, so the multibeam sonar is a critical piece of navigation equipment. On the watches, as we deploy the UCTD probe, which looks like a 2 foot long bullet, weighing about 10 lbs., and good teamwork is the hallmark of a successful launch and recovery. Sometimes we are working in the dark with only the ship’s lights and a flashlight. I have learned how to make a splice in the line – the cord is only about 1 mm in diameter! This line and any splice must be strong enough to hold onto a 10 pound instrument being dragged though 400 m of water at 12 knots. Picture 3 people at 4 a.m. on a moving ship, using tiny instruments to sew a splice in a 1mm line, all while the line is attached to the winch. Like a surgical team, we are all focused and know what tool the splicer needs next. Sometimes quick thinking and a problem solving mindset is needed. There was a foam “bumper” that we had been attaching to the line to cover the probe when it got close to the boat. The probe is expensive and this was protection from it slamming into the steel fantail. When it was lost in the water, the team on watch used a nearby mop to protect the probe while reeling it in. On the next watch, Seb figured out a different solution. Why does it smell like diapers in here? Back in the lab a different bit of problem solving with the scientific method is going on! Often when buoys are recovered, they are fouled — covered with barnacles and all kinds of organisms, fishing line, etc. that get caught in them. Jeff Lord – mechanical whiz – has hypothesized that applying a better “anti-fouling” substance can keep these from affixing themselves to the equipment. He has liberally applied Desitin, a zinc oxide ointment, to the instruments. This is the same treatment for diaper rash on babies’ bottoms! So therefore, the odor in the lab reminds us of diapers. It will be a year before we know if Jeff’s hypothesis is correct, because after the STRATUS 12 buoy is moored, it will be a year before it is recovered. What do you think will happen? Some of the science party was given a tour of the ships technical equipment behind the scenes. 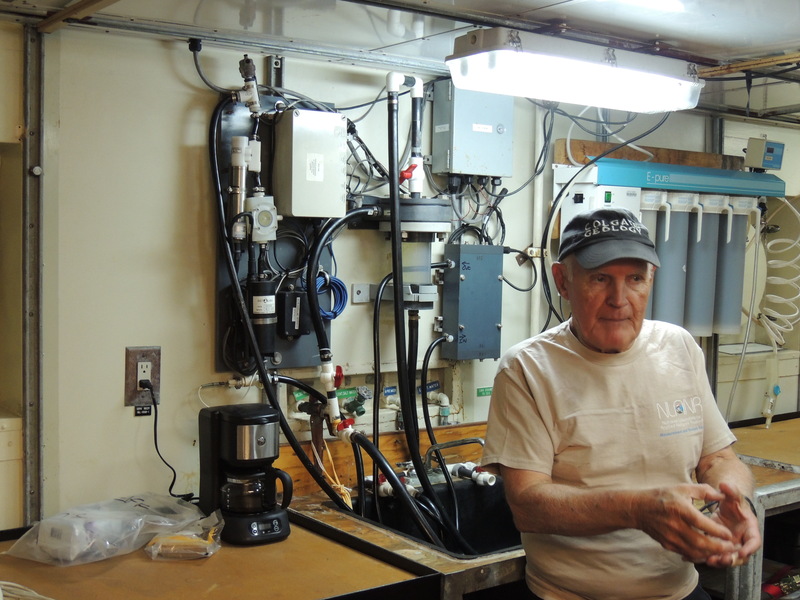 Bud Hale explained not only all of the monitors and ship terminology, but took us down into the equipment rooms where we encountered a gravimeter (measures gravity variations), modern gyros with optics and GPS (measures pitch, roll and heave). 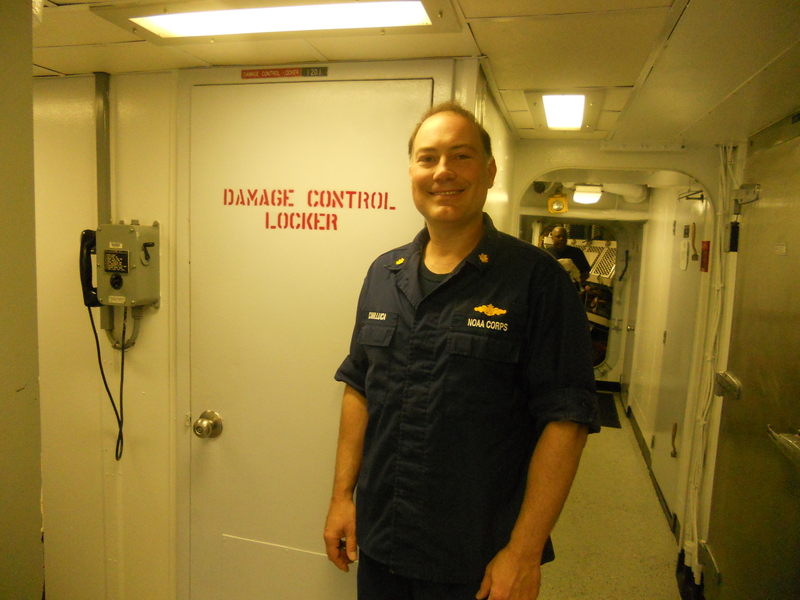 Bud is an expert on all things technical on the ship. He is more than happy to tell you how any of it works! Tomorrow, we hope to see the desalination plant on the ship which gives us our fresh drinking water. After each deployment of a UCTD, data is uploaded into the computer. I’m starting to get the hang of it! Hello from the Atlantic Ocean! 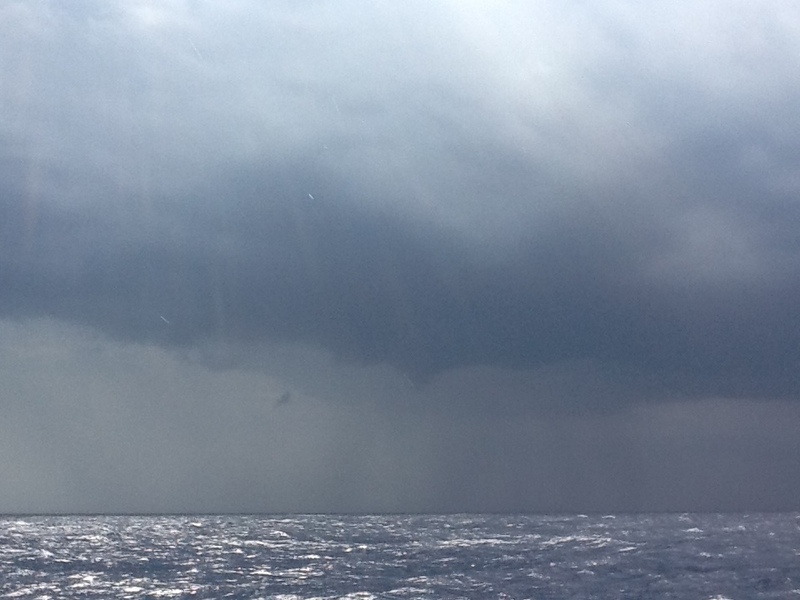 Right now we are about 75 miles off the coast of Savannah, GA. and there is water all around me! The last time we saw land was about an hour after we left the dock yesterday. Before I left many of you asked that I be careful while I am out here. I wanted to tell you that I am safe and that safety seems to be a very important part of being a scientist, especially when you are on a ship. I took photographs of a lot of the safety equipment and information throughout the ship. We even had a safety meeting before we went out to sea. The first mate (he does a lot of work on the ship) showed us how to put on a survival suit, which is something you wear that covers your whole body and has a hood. This suit will keep you warm and floating if something happens and you need to go into the water. After the meeting we had a fire drill just like we have at school, except we didn’t leave the boat. The captain (he is the leader of the ship) sounded the alarm and we all put on life vests and met on the deck. The deck is the back of the ship–the part that is outside. A life vest is also called a life jacket or life preserver. A life vest is put on like a jacket, but it doesn’t have any sleeves. It’s bright orange and gets buckled and tied around you so that you can float if you go in the water. You can see a picture of me in my life vest in the safety video that I made. Many children asked what type of marine life is in the water here. Here is a list and pictures of the animals I have seen so far. After we empty the traps we sort the fish by family. 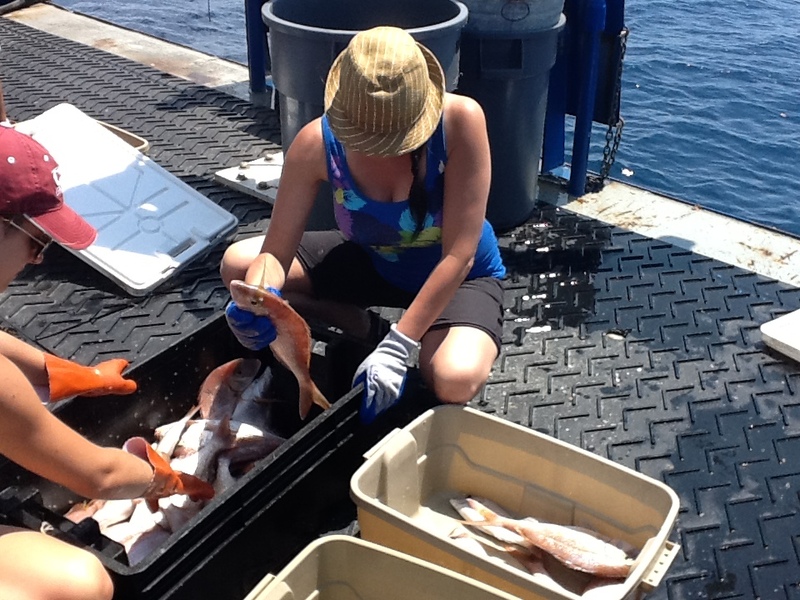 Jennifer (a scientist) and I are sorting Red Porgy in this picture. 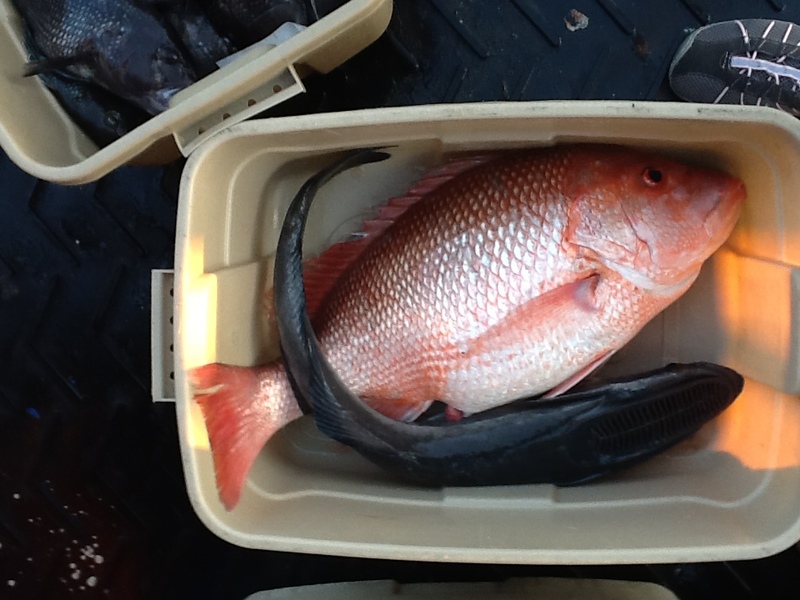 The Red Snapper is the large pink fish. The black fish is a Shark Sucker. If you look closely you can see that the Shark Sucker has a flat head with deep pockets on it that work like suction cups. 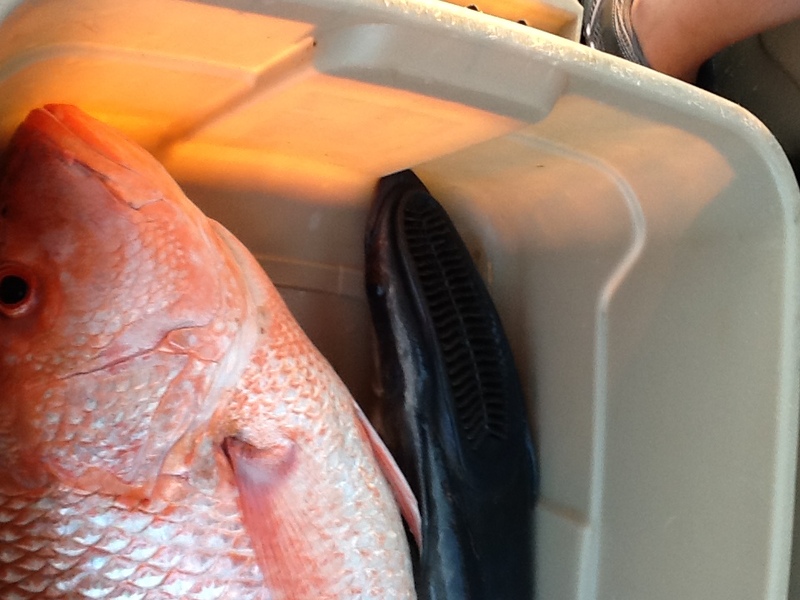 One of the fishermen caught a shark with a fishing pole. We had to get a picture of it quickly so that we could get it back into the water as soon as possible! AND…to answer the #1 question that I have received…(drumroll please) YES! 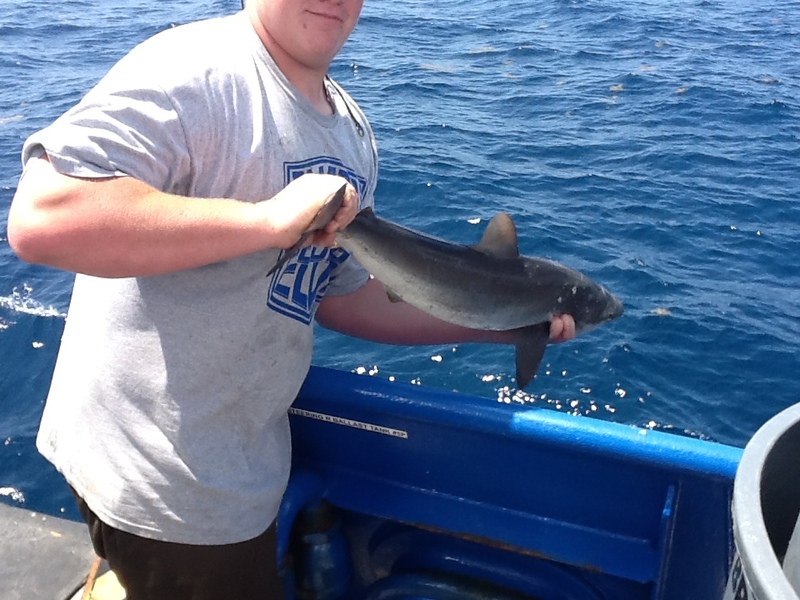 Someone did catch a small shark today! Did you know that you do things in science class that I have seen real scientists do on this ship? What things do you think you do that make you like a real scientist? Check my next blog to find out how you already are a student scientist! Weather Data from the Bridge: Light winds, fog, ocean swells between 3 to 5 feet. Tropical Storm Alberto brought in a low pressure system so Tuesday evening we headed back to Provincetown to wait out the effects. It takes about 12 hours to get between Georges Basin and Provincetown. We spent the day in port and everyone caught up on work and reading. It was a welcome rest from the excitement of the past 4 days. 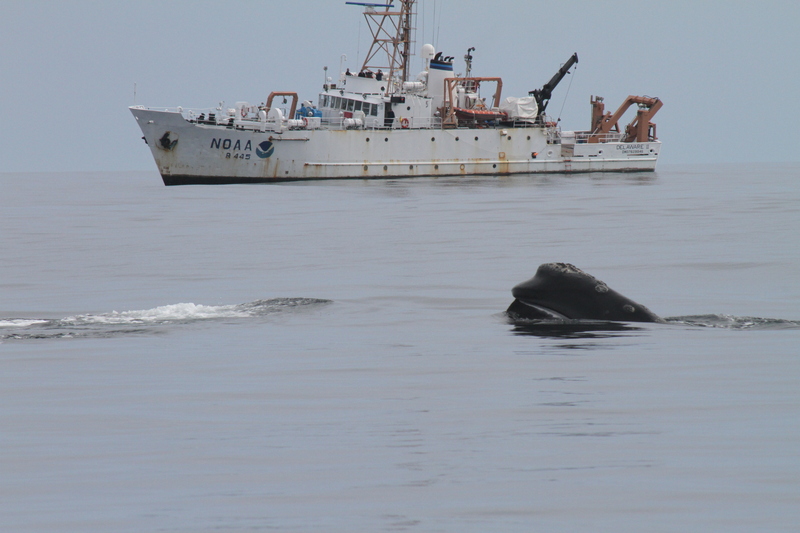 Tuesday evening we pulled up anchor and headed back out to our right whale spot. Unfortunately, the fog creeped in and it was decided to head back to Woods Hole and cut our survey short. I have to say I am disappointed, but Mother Nature isn’t always cooperative and you can’t beat our previous successful days. While my trip is just about over, the scientists still have a great deal to do. The photos need to be matched up with known right whale individuals, whale poop and biopsies need to be analyzed, and reports need to be written. Data collection is very important, but don’t forget you need to handle the data correctly in order to make correct conclusions. Being a NOAA scientist is a very exciting career. For many of these folks, this research survey was one of many. Two of our group will be doing an aerial survey next week searching for previously tagged seals. Other future trips include going to New Zealand on a southern right whale survey trip, and a trip to Alaska on an arctic ocean mammal survey. These people not only get to travel around the world, but they are top in their field and really making a difference in conserving our ocean environment. I feel incredibly lucky to have been one of their team on this survey cruise. It has definitely been an opportunity of a lifetime. 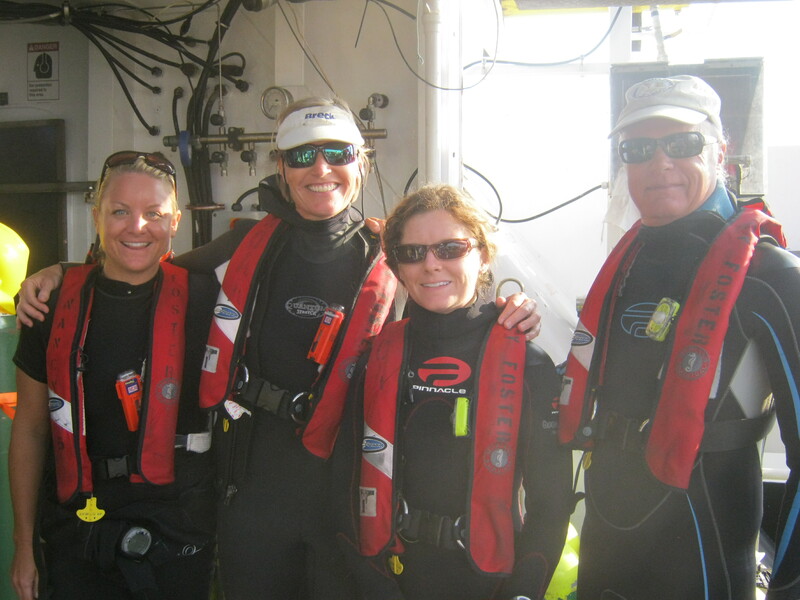 The scientist crew aboard the Delaware II including me! It has been fascinating learning about NOAA. While I have always heard of this organization, and even used their materials for lesson plans, I never fully understood its place in our government until now. So it’s hard to believe my trip is coming to an end. I can’t thank NOAA enough for this opportunity and I can’t wait to bring what I’ve learned into the classroom. This has been a rich experience for me that I will never forget. Memories of trying to walk normally on a rocking ship, to getting within 15 feet of a right whale, and working with these dedicated people will be with me for the rest of my life! It’s finally the day we will leave port! I’m awakened by the feeling of my bed shaking and a crash of something falling, this could have been an earthquake. The science party boards the boat after breakfast and spends a lot of time fastening all equipment down and securing it to shelving; even my laptop needs to be affixed to my desk with Velcro. My stateroom is on the 02 deck, which is one floor below the main deck. I’m in 02-50-2 with a private “head.” Everything is made of steel (even the toilet and shower) and is bolted down, too. Here’s where I will sleep for the next two weeks…and take naps so I can do my 4 a.m. watch shift. As we move out towards open ocean, the R/V Melville – all 278 feet of it – is moving northwest at about 11-12 knots and all seasoned hands comment on how calm the seas are. However, there are factors such as pitch, roll and heave which I am not accustomed to! Ocean conditions affect the ship with roll of about 3° to 5° – swaying back and forth to the left (port) and right (starboard.) Pitch is the hull tilting forwards or backwards and is about 1 ° or less. Heave is vertical displacement of the ship and is a meter or less. The roll starts getting to me after dinner, despite the sea-sick medicine! Fortunately, after lying down for a while, the sickness passes. Next, I went up to the lab where all the monitors are to see what I can learn about our course. Watching the multi-beam sonar display (from the Bathymetry XTD) as the ocean floor drops out from below us is fascinating. An array of 191 SONAR beams maps it out. The colors appear like the depth color key on classroom maps we use of the ocean floor – dark blue where deepest and yellow or even red where it is shallower. The monitors showed the ocean floor depth as it dropped from 2500 m to about 4700 m in an hour or so. The ship was beginning to sail over the trench! This monitor shows the bathymetry or depth of the ocean in real time as we sail. Two safety drills were conducted – a fire drill and an abandon ship drill. 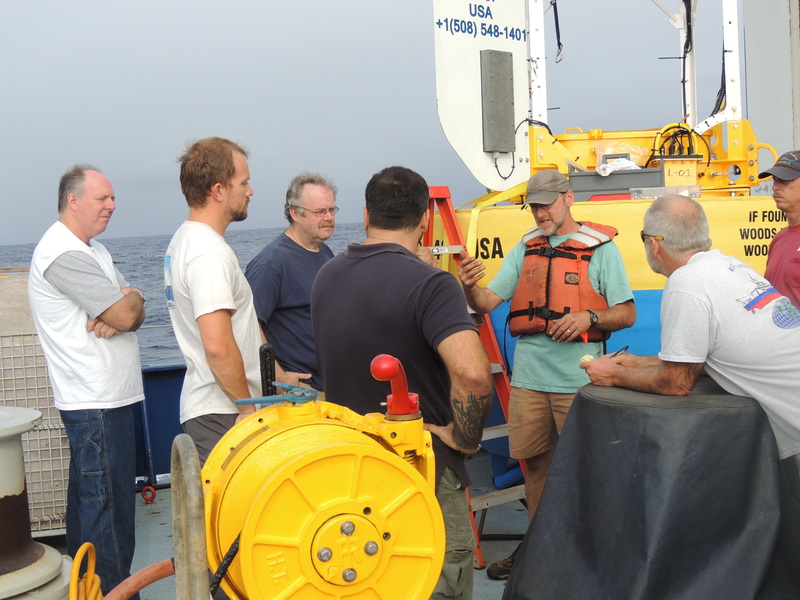 There was also training on the scientific equipment we will deploy, the UCTDs (underway conductivity, temperature and depth probes), and ARGO drifter buoys. Sean Whelan led the class on UCTD training and Jeff Lord prepped us on the drifters. These smaller buoys will be released and will float freely, carried by the currents. 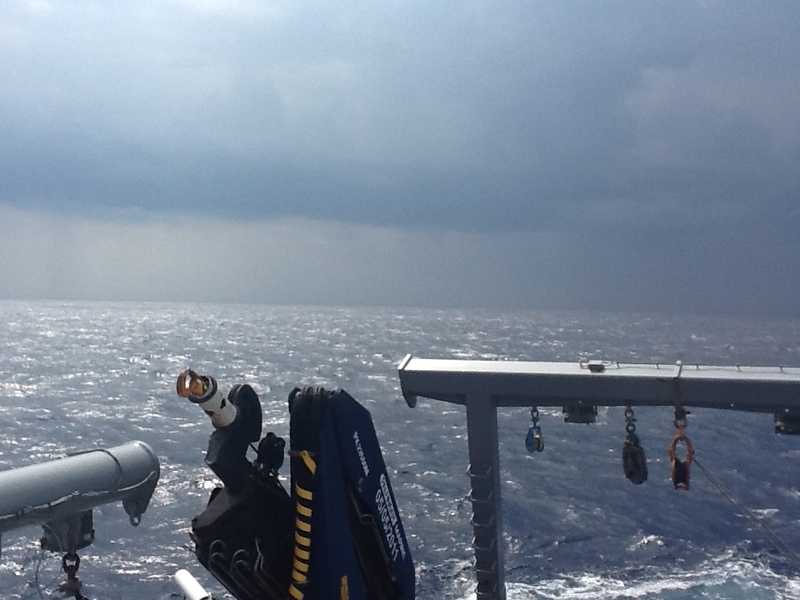 The UCTDs will be deployed hourly around the clock on the aft deck (back of the ship.) Salinity and density are derived from these values. The probe is dropped into the water, will sample for about 2 minutes to 400 m or so and then be retrieved. The casting line is then rewound onto the spool to be ready for the next deployment like a sewing machine bobbin being wound. The data is transmitted to the computer via Bluetooth when a magnetic key is inserted to activate it. 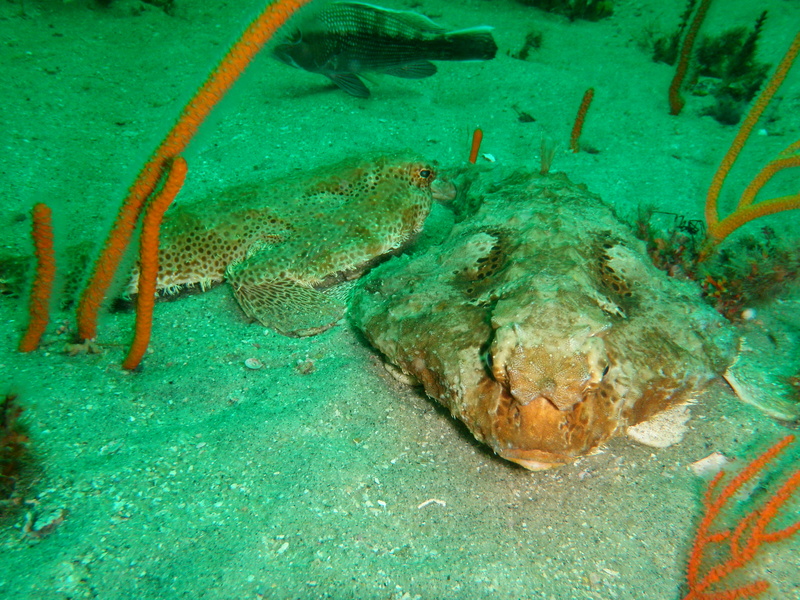 A UCTD is taken back to the surface after gathering data. Sean Whalen, an Engineering technician, taught the class on UCTDs. Everyone was trained how to use the winch as they will need to use it on watch. Each watch has 3 people and is 4 hours long, and then you have 8 hours off. My assigned watches are 0400 – 0800 hours and 1600-2000 hours (4 to 8) so I will need to alter my sleeping schedule! Those on watch must stay in the downstairs lab and conduct UCTD releases during those hours. The instruments inside the UCTD are very sensitive and costly and must be handled very deliberately. There is one more session. 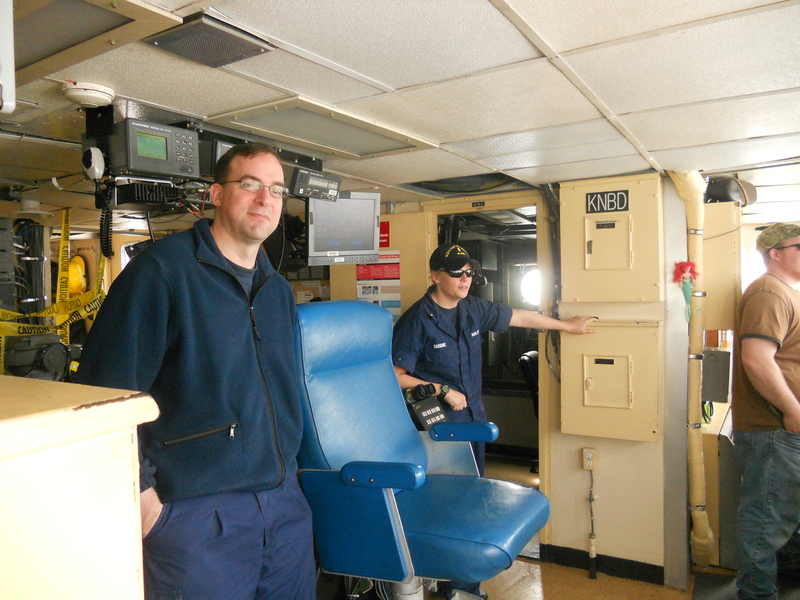 Keith – the ship’s “res tech” or resident technician – conducts a CTD handling class. 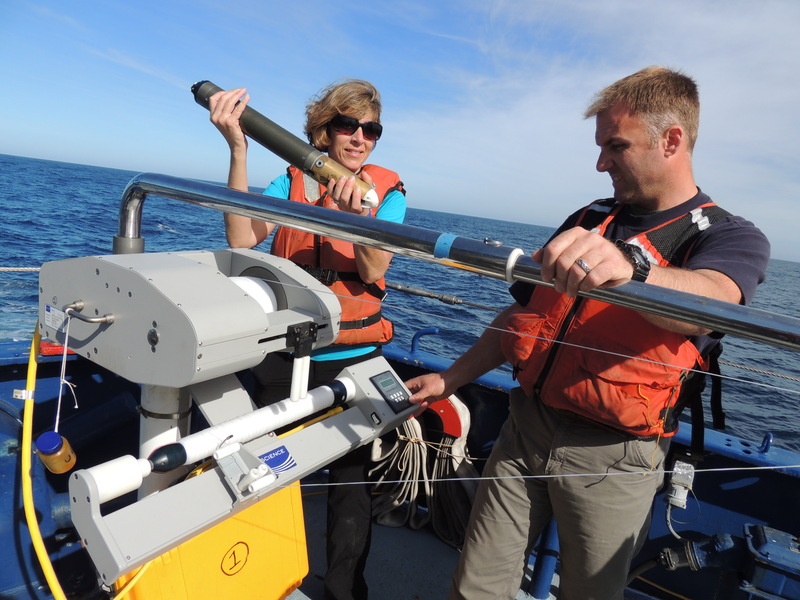 The “rosette: is the circular frame in which water sampling devices called CTDs are placed to take water sampled in international waters. These are different from the UCTDs because deep zone water is sampled for salinity and temperature. This will be done about 7 times on this cruise. It is large and the instruments are housed in a sturdier casing so it is heavier and the winch operator must lower this into the ocean with a crane. 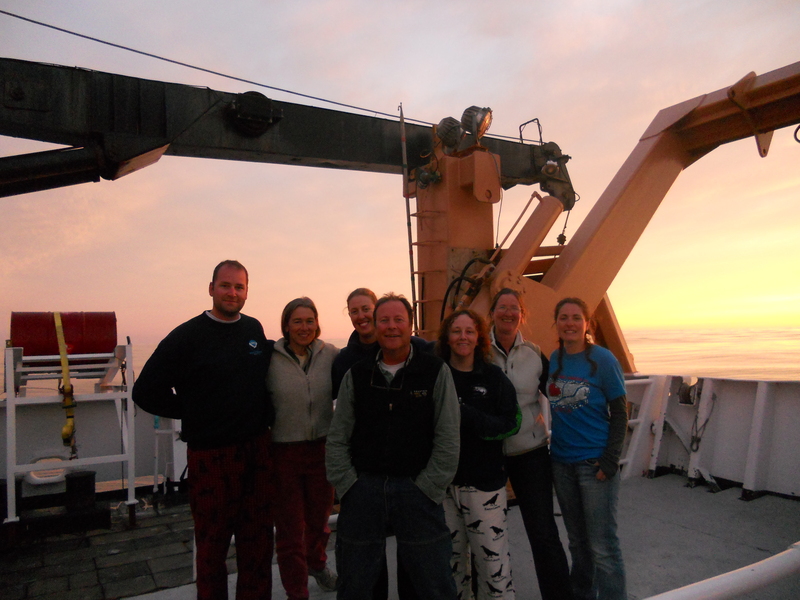 We are looking forward to be seeing some great sunrises and sunsets from our research vessel during watches! 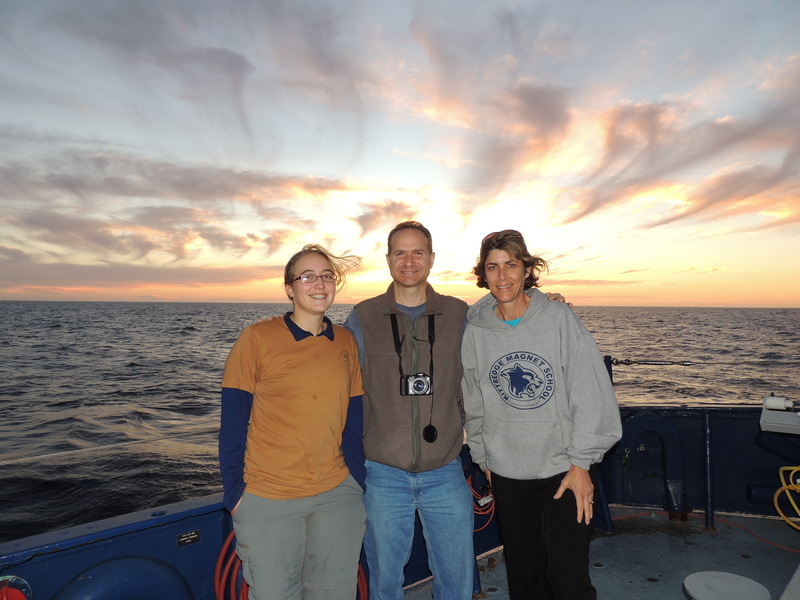 Enjoying the spectacular sunset with me are Elsie Denton, volunteer translator, and Jamie Shambaugh of NOAA. 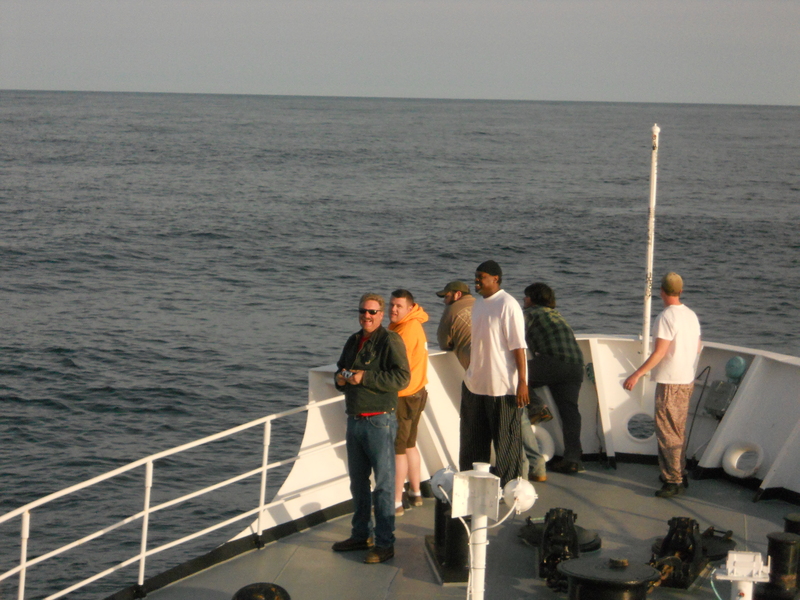 On Tuesday, May 22, science operations on board Nancy Foster resumed. A boat from Gray’s Reef brought more divers. Shannon McAteer is from “Team Ocean”, a volunteer S.C.U.B.A. organization. 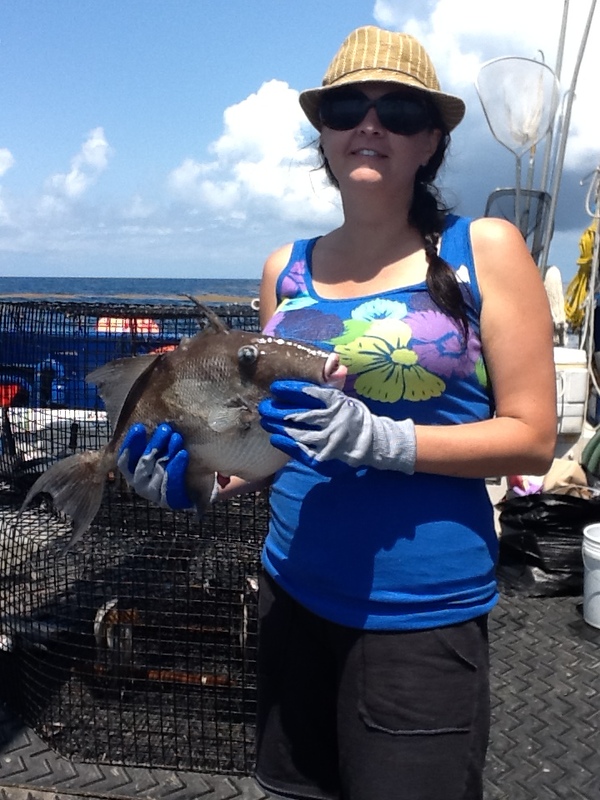 Michelle Johnston is a research ecologist at Flower Garden Banks National Marine Sanctuary in Galveston, Texas. Kelly Gleason is a maritime archeologist in Hawaii. Randy Rudd, named “Volunteer of the Year” for the entire National Marine Sanctuary Program, has been on board from the beginning is also a “Team Ocean” diver. Diver Greg McFall the Research Coordinator/Deputy Superintendent of Gray’s Reef will perform surgery to implant transmitters in the fish. Greg has been doing the underwater filming throughout the trip. 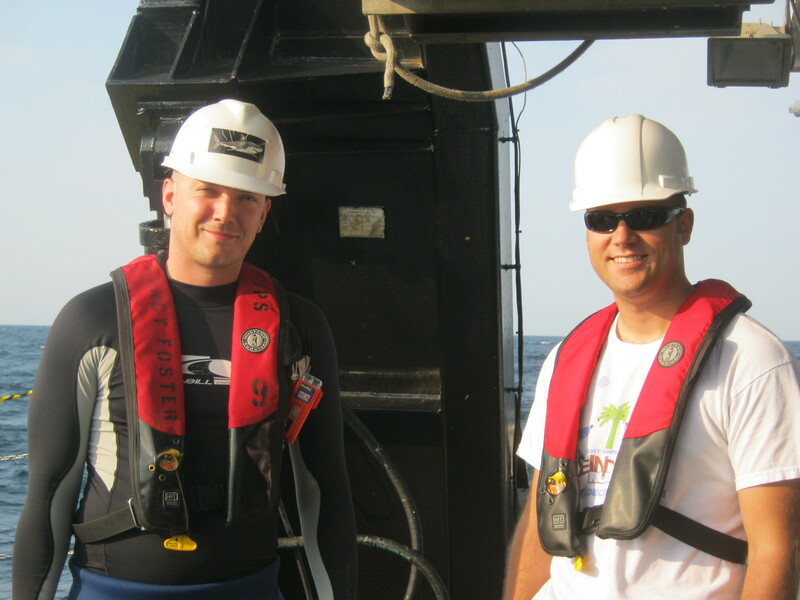 Also, assisting in the dives are Nancy Foster NOAA Corps Officers LT Josh Slater and ENS Jamie Park. 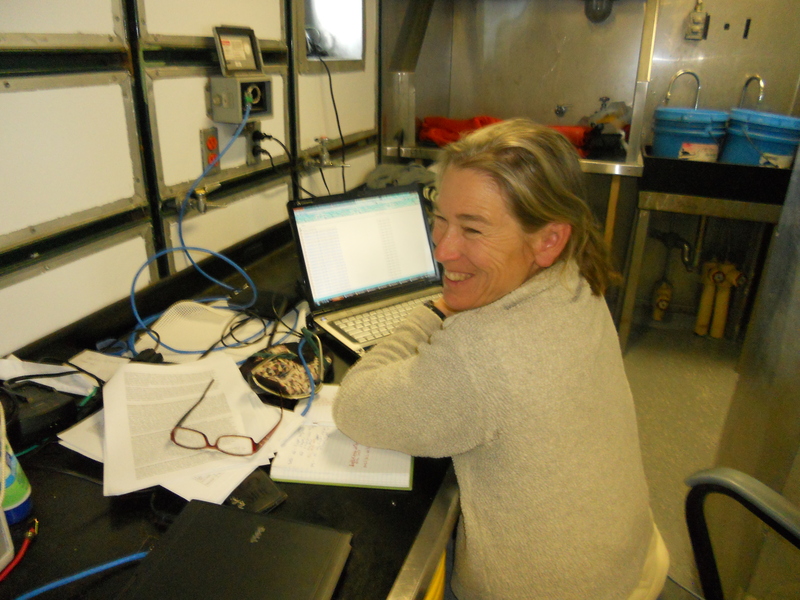 Chief Scientist, Sarah Fangman is coordinating all the dive projects. 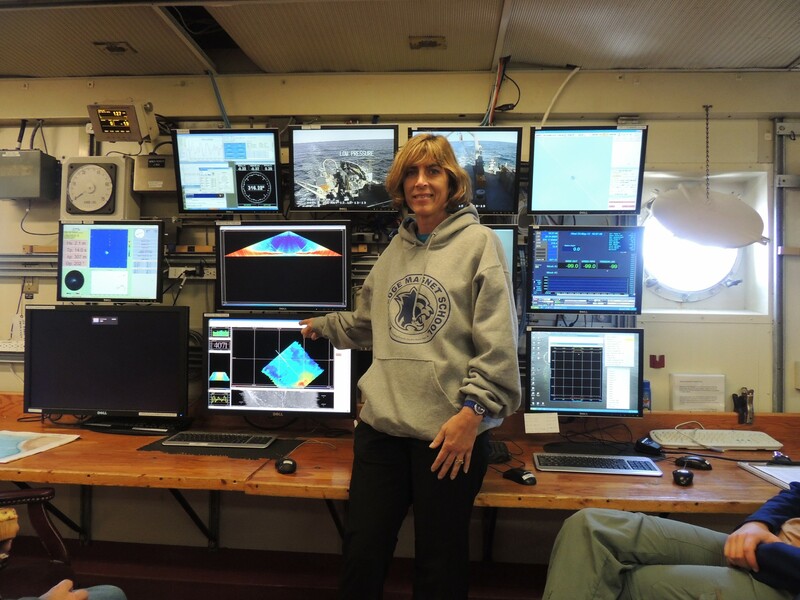 Debbie Meeks is the Financial and Informational Technology Coordinator and webmaster for Gray’s Reef. She has been continually working on the mission website throughout the cruise. The plan of the day is to work on implanting transmitters in fish. The divers have put large cages on the bottom with food to lure the fish inside. The divers will reach inside the cage to grab the fish with a net. One diver will hold the fish “belly up”, while another diver performs surgery. The surgery involves a small cut, insertion of the transmitter, and then a couple of stitches. The fish is then released. Doing the surgery underwater greatly increases the survival chances of the fish. 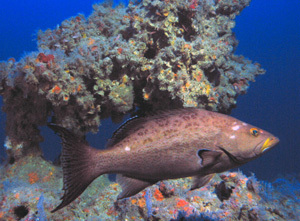 Divers have spotted several tagged fish swimming happily about Gray’s Reef. Yesterday, while I was on “steel beach”, there was an “abandon ship” drill. The signal for this drill is six short blasts followed by one long blast. I had to hurry to my room to get my life-preserver and Immersion Suit (Gumby Suit). I had to report to Muster Station Three. The person in charge of my group was ENS Jamie Park. If we had to abandon ship, we would have to deploy a life raft which is in a large cylinder. The cylinder would be thrown overboard. We would have to get in our Gumby Suits quickly, throw the cylinder overboard, let the cylinder open into a life raft and jump overboard to get in life raft. It was only a drill… However, drills are important to help people get prepared in an emergency situation. The crew has to watch videos to prepare them for emergencies. I watched an excellent video in the mess hall with the crew. The video showed how to prepare for an emergency at sea in event that you would have to abandon the ship. Meanwhile, I will be spending my last day on board. Today is hamburger Wednesday. There will be burgers for lunch. On Thursday, we will dock in downtown Savannah, Georgia. On Friday, I will be assisting the scientists and crew with an “Open House”. People will be able to tour the Foster. On Saturday I will depart Georgia and head to Chicago. I look forward to sharing my adventures with my family, friends, students, and colleagues. I am so grateful for the opportunity to be a “NOAA Teacher At Sea”. I will never forget my time with the wonderful crew of the Foster and scientists which I have shared my experiences.